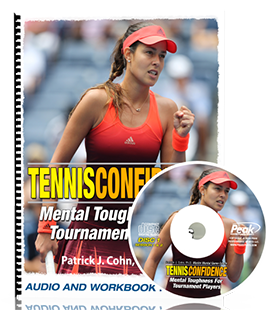 Winning a big match or tournament can provide a huge confidence boost for some tennis players, but there is a large percentage of tennis players that experience a greater sense of pressure after a big win. Pressure to win again, pressure to play at a high level consistently, pressure to beat lower ranked opponents on a consistent basis, pressure to score for your team, pressure to keep your ranking, etc. Experiencing this post-big-win pressure is far too often a common occurrence. After big wins, many tennis players feel all eyes are on them. Wendy is a junior at a Division II university. Wendy has been playing tennis since she was eight years old. Wendy was the second best player on her high school team and even was awarded the “Most Improved Player” award from her team as a sophomore. Wendy’s coaches always told her she was on the cusp of breaking out and playing at a high level and that breakout happened when she won the Fall Classic Invitational Tournament at the beginning of her junior year in college. Wendy’s style of play turned from aggressive to tentative. Wendy felt more anxious than confident and was afraid to make big mistakes. Wendy felt tremendous pressure to win and lead her team to a conference championship. 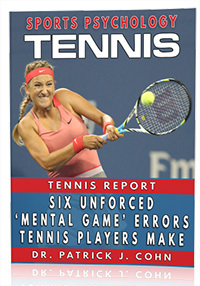 For that reason, Wendy’s play in matches suffered and her junior year was marred by inconsistency. Instead of a shot of confidence, the result of added pressure ultimately resulted in the opposite, fragmented confidence. It is important for tennis players to put things in perspective after a big win, understand the potential trappings of big wins and temper expectations. Just because you won a tournament, doesn’t mean you should win every tournament thereafter. By managing expectations and seeking to play to the best of your abilities for that match, you can take some of that pressure off your shoulders and be at your best. A big win, or to be more specific, the biggest win of her career, is exactly what Naomi Osaka recently achieved. Osaka pulled off the biggest win of her career when she upset Serena Williams in the final of the 2018 US Open to win her first Grand Slam event. Not only did Osaka win, she did so in dominant fashion, and she vaulted herself to a ranking of No. 7 in the World. The question would be whether her big tournament title would translate into confidence or pressure for Osaka. 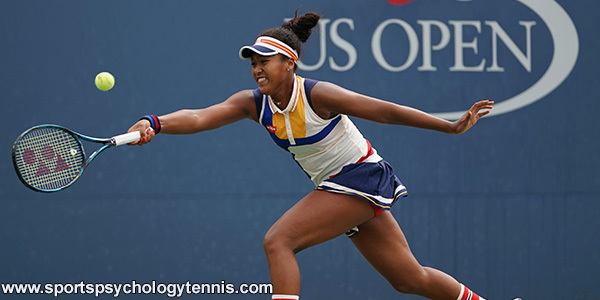 Osaka provided a bit of insight regarding her mindset after she picked up where she left off and cruised 6-2, 6-1 against Dominika Cibulkova to reach the quarterfinals of the Pan Pacific Open. Even though Osaka knew a lot of people would be watching her match, she was excited to play rather than nervous to win. Definitely a great recipe to play confident tennis in your next match. Playing your best tennis requires you let go of expectations about winning or the scoreline. Be on alert for telling yourself statements that emphasize the word ‘SHOULD’. Instead of playing with the ‘SHOULD’S’, stay focused on the process of playing each point to your max capacity and not dwelling on a lost point. Focus on your preparation for each point instead of judging how well you did on the last point, which is based on your ‘shoulds’.